Francesco Bergamini was an Italian artist who specialized in interior genre and religious scenes, as well as the occasional commission for a portrait or fresco. 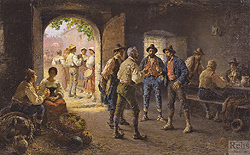 He received his formal training at the Academy in Carrare under the direction of Giuseppe Diotti (1779 – 1846) - an artist who specialized in religious and historical scenes as well as portraiture and frescos. 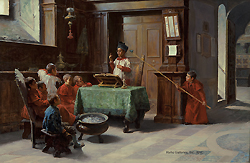 The Altar Boy's Sermon is a mature example of Bergamini’s works and not only displays his strong academic training, but beautifully illustrates the influence of the French Impressionists were having on not only him, but on many artists of the period. His figures are anatomically correct, but are created with a looser brush stroke and colorful palette.